Start your car from almost anywhere | What Car? A new iPhone application that can remotely start your car from almost anywhere in the world has been revealed. 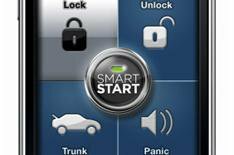 The iPhone-based Viper Smartstart system extends the range of the car's own remote control by using the mobile phone network. Press a button on the iPhone app's screen and the software sends a signal telling the car, wherever it is, to start. The system can also lock and unlock doors, arm and disarm a security system, open the boot and act as a panic button. The $500 (around 300) kit includes all the electronics for the car, including the remote starting activator, and is just the latest in a range of iPhone-based apps developed by the US motoring industry. A genuinely useful app has been launched by Massachusetts-based car-sharing service Zipcar. It enables members to locate cars that are available for use, reserve a vehicle and unlock and start it - all using the iPhone's touchscreen. The GPS system helps find the car and book it then, on arrival at the location, a button press on the phone will sound the car's horn to help you find it. Swipe your membership card over a reader through the windscreen, and then the iPhone can unlock the car and release the keys. Zipcar operates in 50 cities across America, with members paying a $50 (30) annual fee, plus $7 (4.20) an hour for use of a car. It also has a limited number of Zipcars available in London.